Having a damaged car window is an unexpected and unwelcome event here in central Oregon,but now you've come to the right place. Act Fast Auto Glass is not only fully trained, but we're equipped with the best and latest auto glass replacement and glass repair technologies available. We only use quality replacement glass and all our work in backed by a lifetime warranty. Based in Bend Oregon, we are a locally owned & operated family ran business. Offering mobile auto glass service to all of our customers in Bend and Central Oregon. A leading provider for windshield replacement, rock chip repair, door glass,back glass or side mirrors for any and all vehicles on the road today. The glass in your vehicle is a Critical Safety Component. Don't trust the safety of your family to anyone other than Act Fast Auto Glass. WE COME TO YOU! Call Today or e-mail for a free quote. 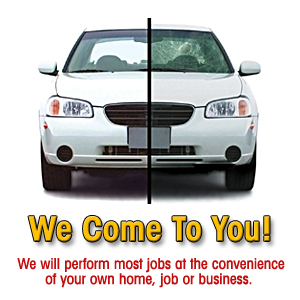 We will exceed your expectation of an auto glass repair shop. We strive to use our expertise and professionalism to provide exceptional service to all of our customers. Knowing that referrals and repeat customers are the best measure of our success. I just wanted to provided a few words about your service. I had a windshield replaced on my ford F-150 this last Thursday; 30 July 2015 and the work done was absolutely outstanding. The two men who came and performed the job were very courteous, professional, and knowledgeable during the entire process. Removal, replacement, and clean-up were all accomplished within about 30 minutes. The work was done professionally and quickly, they arrived on the job site exactly when I was told to expect them, there was no delay and it wasn't about being around for a 4 hour window; I was told what time they would be there and they were right on time and began the job. I was very impressed with my overall experience with Act Fast Auto Glass and will be recommending you to all my friends and relatives. Was in Bend on vacation and Act Fast fixed my windshield same day and at a great price. He even showed up for free at my hotel!!!! Extremely knowledgeable and professional. The Windshield was flawless and actually better than before, turns out my old windshield had warps in the glass which made my wipers not contact properly. Highly recommend Act Fast. I have used Act Fast twice and both times Jonathan was great. He came to my office to fix my windshield and was very fast. I've not had any problems with the windshields since he replaced them. He worked with my insurance company and I didn't have to do a thing. I would recommend Act Fast Auto Glass for fast and friendly service. He came to my home in sisters. The job got done the next day after I called. So pleased my daughter had to go back to school in the valley. He was on time did a really nice job! I highly recommend him_nice young man take pride in his work!